Downtown San Antonio is a very special place, and to fully experience it you need to stay downtown. Trying to save a few dollars by staying out on the city's edge and driving back and forth defeats the purpose of your visit. Besides the aggravation of getting back and forth, the parking cost will nullify any savings you think you're gaining. 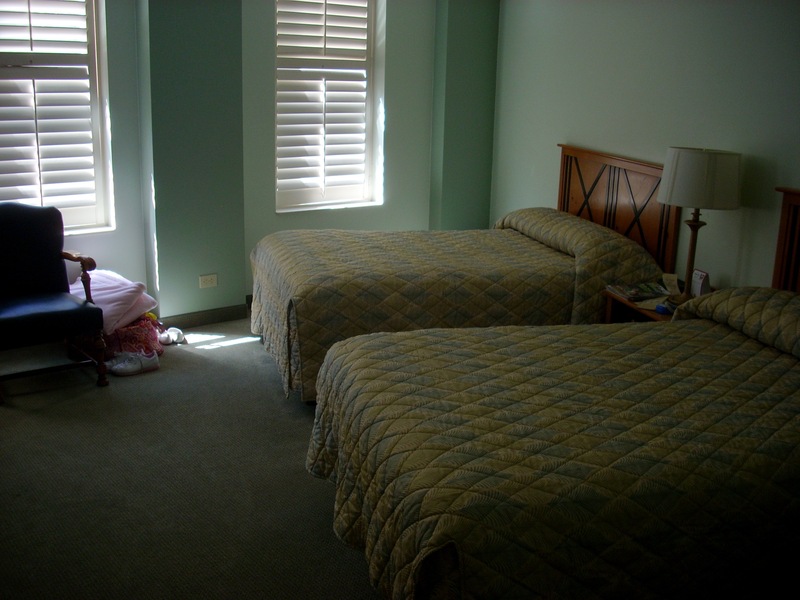 And once you decide to stay downtown, our lodging recommendation centers on a single hotel. You really need to stay at the historic Crockett. The windows you see in this picture at right look right out on the Alamo. The stairs start down to the Riverwalk just at the edge of Alamo Plaza. Right across the street from the Crockett, to the right in this picture, is RiverMall, the largest glass enclosed structure in the world. 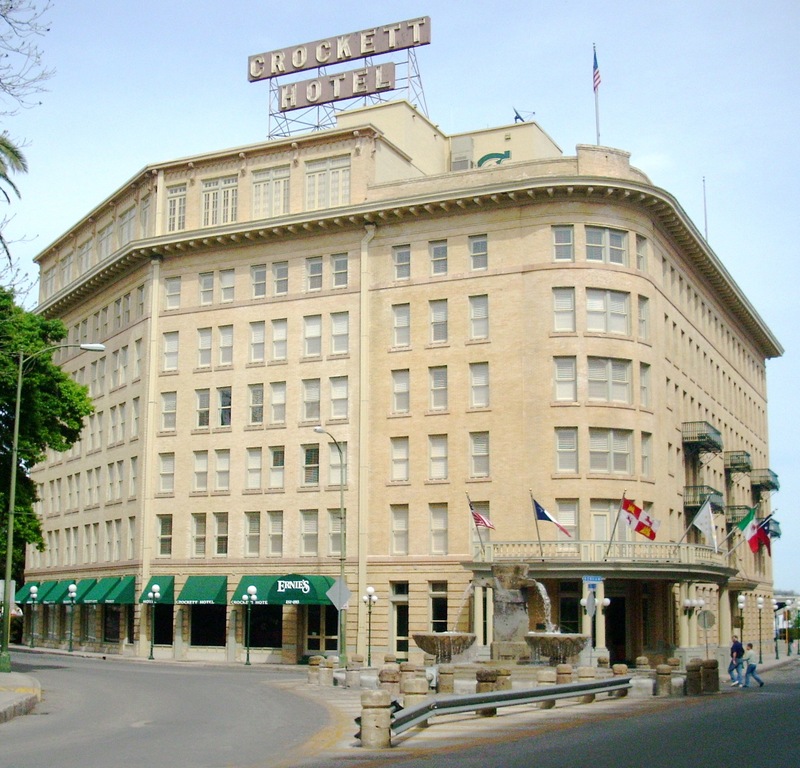 The Crockett is one block from Commerce Street, the main street of San Antonio. So the location cannot be beat. But you also need to stay here for the historic value of the hotel. This has always been THE hotel of San Antonio. Presidents, kings, queens, athletes, movie stars, executives, and other celebrities have made this their headquarters for over a century. Small by modern standards, the Crockett has only six floors, 138 guest rooms and a modest lobby. But a renovation back in mid 20th Century and another one in 2007 have kept it on the cutting edge. You have key card security, wireless internet, and the usual package of refrigerators, hair dryers, irons, in room movies, etc. You have secured parking and full concierge service. Suites are available for families or groups (those are the rounded window sets on the corner of the building). The only caution is that you have to make reservations ahead. The Crockett remains a popular hotel. Individuals, families and groups have been returning to it every year for decades. Conventions are housed here almost every week (those larger windows up on the seventh floor are executive meeting rooms). So book early. But it's worth it. We've stayed in hotels and bed and breakfasts all over the country and The Crockett offers the finest complimentary breakfast in the 21st Century. This is the kind of continental breakfast everyone USED TO provide, but one by one even the great New England bed and breakfasts have cut way back. Not the Crockett. You get several kinds of juices, coffee, and tea; a magnificent array of fruits, strawberries, blue berries, and whatever else is in season; breads, bagels, toast, Danish and pastries; Texas shaped waffles; various flavors of yogurt; cereal; and on a rotating basis French Toast, pancakes, eggs, frittatas and other items. On top of all this the hotel provides compliementary copies of the San Antonio daily and USA Today for you to peruse while eating breakfast. The setting for this morning feast is shown below right, a classy restaurant just off the lobby, with windows looking out on the Alamo (under the green awnings at far left in the photo above). You thus leave the hotel for the day's adventures well fed and informed of the day's news. This breakfast will tide you over until a late lunch and even then you won't be too hungry. 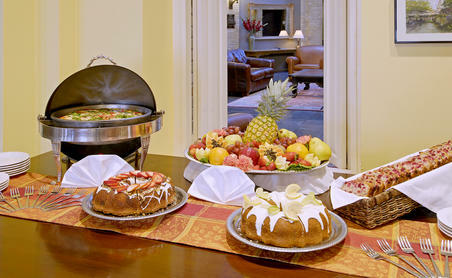 Breakfast is also a good time to meet other hotel guests, who come from all over the country, many returning every year. They range from families with kids to high school and college classes here to study history, architecture or botany to conventioneers. On our last visit a group of chemical engineers were in town for a symposium on battery technology to power the new electric cars. The Boston Celtics or Los Angeles Lakers may be in town to play the Spurs a few blocks away at the A.T.& T. Center. Or the hotel may be taken over by fans of one of the NCAA Tournament teams, playing over at the Alamo Dome. 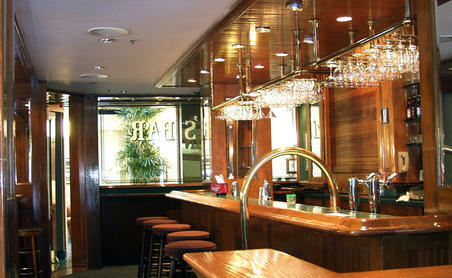 On the other side of the lobby from the restaurant is Ernie's, the current name for the famous and historic bar. With each renovation Ernie's gets a new name, but over the years famous writers, actors, politicians, business tycoons and other big names have gathered here to enjoy drinks and conversation. James Mitchener became a regular during the two months he spent at the Crockett researching his famous novel Texas. John Wayne came in every night back in the sixties while filming his version of The Alamo (they built a replica elsewhere and filmed the battle scenes there, but filmed leadup scenes here for historical accuracy), and 50 years later Kevin Costner liked to sit at the corner table and gaze out at the old mission while he was researching his remake of the same film. It's Costner's version which is now shown twice daily just across the street in the new IMax Theatre. Larry McMurtry frequented this bar while visiting The Texas Land & Cattle Company to gather material for his novel Lonesome Dove. Lyndon Johnson dropped by whenever he was in San Antonio. O.Henry hung out here during his San Antonio writing career. 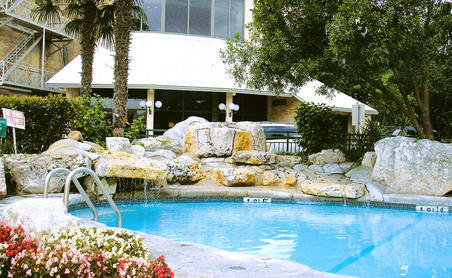 The Crockett's pool is outdoors, meticulously landscaped with rocks, trees, flowers and other greenery. 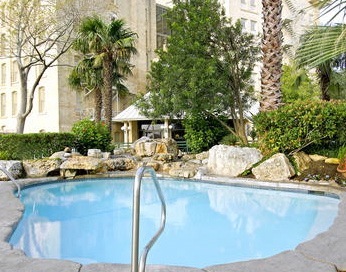 The climate here is usually warm and humid, so the pool is a popular stop after a day exploring downtown San Antonio. After the Alamo closes each evening, the plaza quiets down, and while floating lazily in the pool the only sound is the clippetyclopping of horsedrawn carriages passing by. Crockett rooms are quietly plush. Some have king beds, some two doubles, and some are suites. This particular double is one of our favorites, slightly larger than the others, because it occurs on each floor at the angle you can see in the photo above where the hotel conforms to the bend in the street. This gives the room an angled shape. Three windows look out on the Alamo and have heavy wooden shutters you can tilt to admit varying degrees of sun, or you can swing the shutters totally open. The tv is quite large. The bathrooms, even though remodelled in 2007, retain their 1950s flavor, but are quite spacious, with high showerheads. The numbers on these rooms are ---06 (206, 306, 406, etc.). If you want to look out beyond the Alamo to see the whole plaza, you need one of the top two floors : 506 and 606. These are nonsmoking rooms. There's a work table big enough for a full sized laptop computer and the folders or papers you would normally need. The ultramodern hotels down on the Riverwalk charge twice as much for their rooms, but they're neither bigger nor better than these. 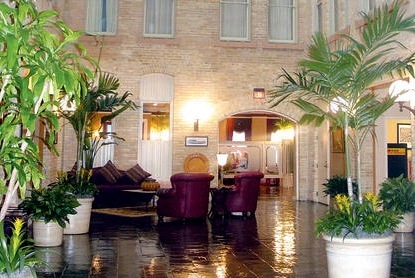 However, if the Crockett is full, our second recommendation is the Menger Hotel, just across the street. The Menger was built even before the Crockett and has a history just as colorful. It went up in 1859, just 23 years after the Battle of the Alamo. 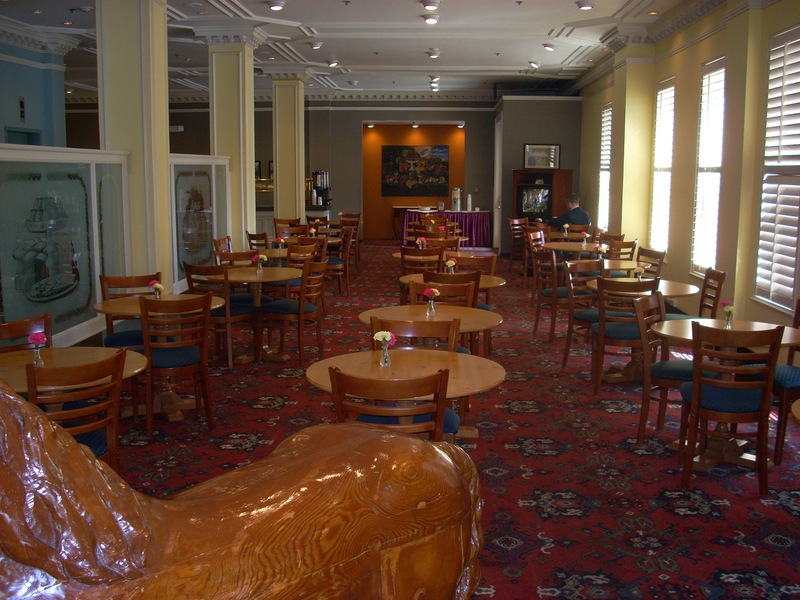 The Menger today offers five stories, 316 rooms, and a fine restaurant. The Menger's most colorful character was Teddy Roosevelt, who spent two weeks here in 1898 recruiting his famous Rough Riders to fight in Cuba in the Spanish American War. They were the ones who made the famous charge up San Juan Hill. But Sidney Lanier, Babe Ruth, Robert E. Lee, Mae West, Ulysses Grant, Sam Houston, William McKinley, Howard Taft, Dwight Eisenhower, and a long list of movie stars, athletes and tycoons stayed here. The Victorian Lobby of the Menger is one of the most photographed scenes in San Antonio. The bar is famous. Manager Hermann Kampmann sent the architect to England to study the House of Lords Pub. They imported booths, bevelled mirrors and the panelled ceiling of cherrywood from France, and the decorated glass cabinets from England. The bar cost $60,000 to build, quite an expense in the 1800s. In 1876, barbed wire was first demonstated to the public here, and the first orders taken for its sale. Richard King, founder of the million acre King Ranch and one of the richest men in Texas history, feuded with the cattlemen of the Texas Land & Cattle Company so stayed here when in town, and died here in 1885. 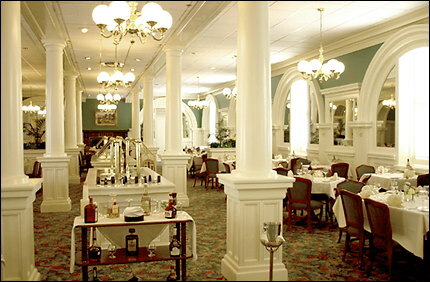 The Colonial Room Restaurant, shown at right, recognized as one of Texas' best for 150 years, was remodelled in 1912 in the neoclassical style it retains to this day. Unlike the steakhouses and Mexican restaurants for which San Antonio is famous, the Colonial serves a classical menu. The Colonial also offers garden seating out on the patio. The pool (left) is tucked inside the interior courtyard. It is the largest pool in downtown San Antonio. 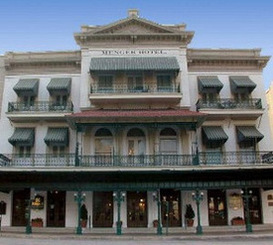 Anyone into the supernatural will love the Menger, which is supposed to be the most haunted hotel in America with 32 different ghosts often seen walking its halls or hanging out on its porches, balconies or patio. They reportedly disapprove of the pool and will not approach it. The third hotel on Alamo Plaza is the ultramodern Riverwalk Hyatt. 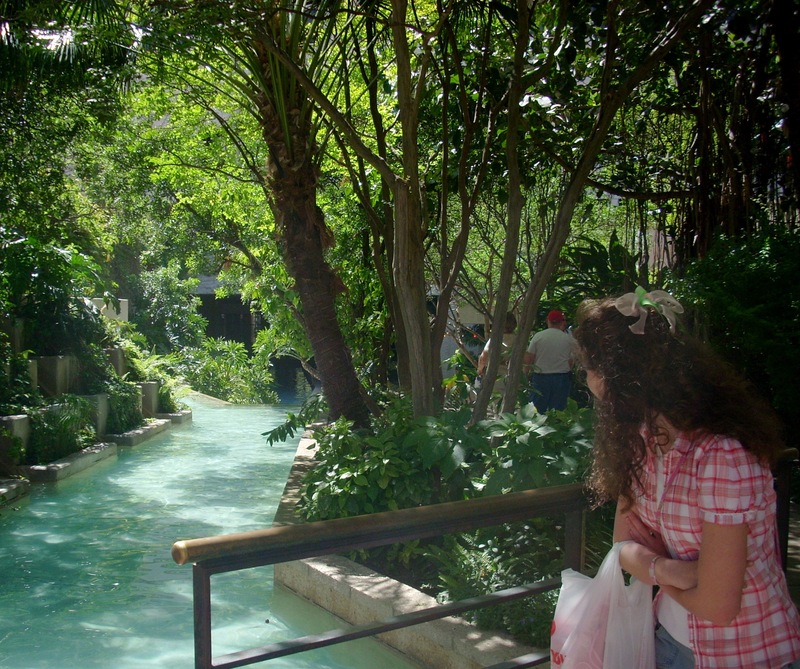 You walk through its 16 story atrium to get down to the Riverwalk from either the Crockett or Menger. This is a typical 21st Century palatial hotel, with rooftop pool and hot tub, top 10 restaurant, spa, shops, interior waterfall, full gym, and all the other amenities. Incredibly, its rates for basic family doubles or basic king bed singles are the same as the Crockett and Menger, if you make reservations far enough ahead and belong to either AAA or AARP or qualify for any of the other traditional discounts. You obviously don't have any of the history here, but you can get a room looking down on either Alamo Plaza or the Riverwalk. The Hyatt also offers an impressive complimentary breakfast and it almost seems they're in a competition with the Crockett, because they're both memorable. The Hyatt has three times as many rooms as the Crockett or Menger so it's easier to get a reservation, but we still recommend calling well ahead. The Hyatt features an outdoor - indoor subtropical rainforest along the walkway through its atrium (left). 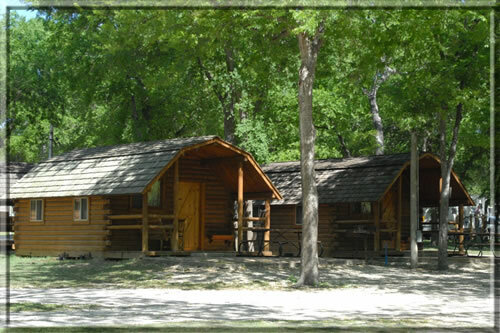 If you're travelling with a Scout or church group and insist on camping, the San Antonio KOA is one of the better KOAs. It definitely favors RVs, but the tent camping is way at the back and offers grassy sites under beautiful big pecan trees. There are two pools and hot tubs, to serve both front and back campsites. Both are very nice, although the hot tubs are small. The showers by the front pool are better, but both rest room and shower complexes are kept quite clean. The tent sites have tables, water and grills. A bus stops at the front gate of the KOA and brings you down to the Casa Rio bridge on the Riverwalk, so you're right in the middle of everything. It costs $3 each way per person. The last bus outward bound departs at 10 pm from the big red sculpture across the bridge from Casa Rio, so make sure you keep track of time. If you're worried about weather, the KOA offers two groups of KOA Cabins. They're sort of a compromise with the camping experience. If you choose this option, call a week or so ahead and reserve cabins in the rear group. The ones in the front of the campground are too close to the road and heavy trucks may keep you awake. From the rear of this rather large property you can't hear them. You need your own sleeping bags.